Description: This is looking towards the rear end. 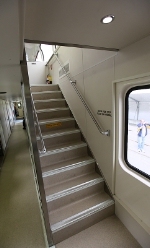 Description: The other train is the arriving MEX (McKinley Express) operated by ARR for Princess Lines in the summer Whittier to Princess's Lodge near Talkeetna and return each Saturday and Monday. The train is based in Seward. 751 heads ARRs Coastal Classic runs daily in the summer Anchorage to Seward in the morning and returns in the afternoon. This is the northbound returning to Anchorage. Title: ARR 751 Leaving and ARR 4320 Arriving and DEX Is Also in Town All Around 7 pm. Description: 751 has ARRs Glacier Discovery which runs daily in the summer Anchorage to Whittier in the morning and Whittier to Anchorage in the evening. Midday it meanders among the glaciers south of Portage. 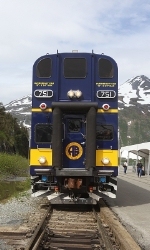 4320 has the MEX (McKinley Express), operated by ARR for Princess Lines in the summer Whittier to Princess's Lodge near Talkeetna and return each Saturday and Monday. The train is based in Seward. Description: That's Princess LinedDiamond Princess. ARRs Glacier Discovery runs daily in the summer Anchorage to Whittier in the morning and Whittier to Anchorage in the evening. Midday it meanders among the glaciers south of Portage.